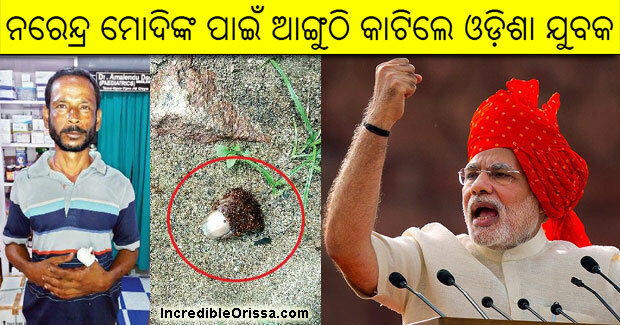 A 45-year-old man from Odisha chopped off his left thumb on Monday and offered it at a Hanuman temple on the outskirts of Kendrapara town praying for the long rule of Prime Minister Narendra Modi. Sashikanta Sahoo, a native of Samagudia village, reportedly raised slogans in favour of Modi in the temple before chopping his thumb with a sharp weapon. He then threw the severed finger at the feet of the deity. He timed his ‘sacrifice’ for Independence Day eve. When other devotees at the temple, located in nearby Ichhapur village, sought to know about blood dripping from his palm, Sashikanta pointed towards the finger lying at the feet of Lord Hanuman.